No business, large, medium or small, takes the need to relocate lightly. It’s an undertaking of massive proportions, especially for large, multi-faceted operations. Properly communicating the move to your employees will go a long way toward making the office relocation proceed as smoothly as possible. Since you’ll need to have everyone on board and preparing to do their part, you should be ready to communicate the news in the best way available for your organization. To effectively announce and relay the information about moving to your employees, come up with a plan involving all of your department executives and managers. Assign them the responsibility of ensuring each employee in their charge receives the message and any ongoing updates. Because corporate cultures and attitudes flow from the top, be nothing but positive about the move. Make sure the upper management team will adopt and maintain a genuine enthusiasm for the project as they notify their sections of the company. The actual day of packing and moving may still be a year away, but once the new location is locked in, don’t delay putting out the word. The idea of waiting until the last minute to announce the move so as to allow little time for complaints may be tempting, but that would be a big mistake. It’s better to send the notice, hold the meetings and answer questions early in the game so any opposition can come to light and be respectfully regarded in plenty of time to work out solutions. Employee questions about commute times, parking and workspace changes will crop up. If some employees find the move untenable to their personal situations, you need to know that and be ready for some changes in your staff. A big office relocation announcement can’t be a one-time thing. Regular newsletters, emails or postings with progress reports are key to generating a company-wide excitement for the move. Maintain an enthusiastic tone in all communications, even when the update news means greater challenges to the employees. If you anticipate issues during the move, let the employees offer solutions to their managers. You may be surprised by some very good ideas coming from the trenches. By keeping your employees in the loop and allowing feedback, you can alleviate their fears of the move and stimulate a team mentality. Once they know they won’t be responsible for the heavy lifting but can retain some say in how their personal workspace comes back together in the new location, most of your employees will take on some extra responsibility. A great idea, if feasible, would be to organize field trips to the new site so the employees can see for themselves what the move is all about. Planning and executing an office relocation with very little downtime requires a concise, detailed plan and a whole lot of labor. There’s a good chance you’ll need professional help to manage the schedules and all the details. Expert Relocation Systems has successfully moved hundreds of businesses over the years. We can expertly handle the initial planning, create and manage the scheduling with IT, vendors, office managers, and shop/warehouse management. We can arrange for storage during the several stages. We’ll also provide protective crates and labor. The list goes on. In short, we can provide everything for a move exactly as your business requires. If you plan to install new furniture and room dividers, we can even be there to receive the delivery of the new units and assemble them for you. For more information on how we can help your company move, please contact us today. Knowing how easy we can make your relocation, you should have no problem communicating the move to your employees. Printing every order, email, or company memo results in a growing pile of paperwork that can quickly overwhelm even the largest offices. Going paperless reduces environmental damage, saves time and space, reduces redundancy, and prevents data loss. However, it’s also a major task that must be handled with care to prevent the accidental loss of important information. Prepare for the changeover with these helpful tips. Start out slowly by making office policies that reinforce the benefits of using digital storage instead of the printed page. For example, downgrade to just one or two printers and set them on a code system so that you can track who’s actually doing the printing. Working with individual employees to show them how to break the printing habit and go green may be time-consuming, but it’s necessary if you want the paperless system to become accepted among your workforce. Switch to paperless options for incoming mail like bills, notifications, and vendor agreements. In order for everyone to access the same information they used to print or check on paper, you’ll need to implement a single document storage and sharing system. Training everyone to use this system is crucial, so set aside a few weeks for getting everyone up to speed. There are hundreds of options, from free programs like Google Docs to enterprise-level solutions with licenses that run $20,000 a year. Take your time when choosing the right document system since it will be difficult to switch later after everyone is finally familiar with your first choice. Contracts can be one of the hardest paper habits to break. Unless there are very specific legal regulations barring you from doing so, switch your business over to digital signatures. The ESIGN Act of 2000 allows for digital signatures to count as legally the same as handwritten ones, so most companies should be able to take this step. Paper is going to creep back into the office over time unless you give your employees realistic ways to continue their established habits without it. For example, many people print out long and complex instructions so they can glance at the paper in hand and then back to their computer screen. Instead of asking your workers to juggle this kind of task on one screen, set up multi-monitor displays. Your workers can use one of the monitors like they would use a printout, then finish their work on the other screen. Once your office is in paperless mode, it’s time to turn your backlog of paper into useful digital data. Instead of just scanning and shredding, try using OCR software to pull text from the printed page so it can be searched, copied and otherwise manipulated with less work. A move to a new office is the perfect time to go paperless. If you need more help with your corporate relocation, contact the team at Expert Relocation Systems. Throwing waste in the trash means it ends up in landfills, where it contributes to air, water and ground pollution. If you want your office to join the green movement, it’s time to start encouraging employees to recycle rather than blindly throw things into the trashcan. Here are several ways that you can introduce a recycling program to your office. Paper is one of the biggest waste products that businesses produce on a daily basis. When you’re starting to recycle in the office, focus on paper first. Let employees know that they should be recycling paper and not to put it in regular wastebaskets. You can also help by cutting down on the amount of paper that your office uses. You can do this by printing on both sides of paper instead of just one side and encourage employees to communicate through email, take notes using apps or software programs and hold slideshow presentations instead of printing several pages of information for meetings. Employees are more likely to participate in a recycling program at work when they know where recyclable materials are supposed to go. They should also be able to access these bins easily. Place recycling bins that are clearly labeled in the kitchen for cans and other recyclable products. You should also put labeled recycling wastebaskets near printers and copiers. This makes it simple for employees to recycle paper instead of throwing it in the trash. Set aside one day for raising awareness of the importance of recycling in the office. You can educate employees on how important it is to recycle through engaging presentations. During these presentations, you should emphasize how recycling has a positive impact on the environment and can help the company save money overall. For example, using less paper results in lower supply expenses. When employees are used to recycling paper products, cans, and other kitchen products, you can start having them recycle other materials. These include toner from printers and copiers, electronic equipment, furniture and light bulbs. Educate employees on the right way to recycle these products. For some, such as electronic equipment, you might need to assign someone to gather these on a regular basis and handle making sure they get to the right place for recycling. If your business is moving to a new location, Expert Relocation Systems can help. Contact us at 512-291-MOVE for more information about our relocation services. One of the first, vigorously-enforced rules at school is the law of sitting still. With broken spirits, our inner children grow up and move on to longer school days, then, eventually, jobs that require — guess what? — more sitting. But we’re not just sitting at desks anymore. We sit in our cars, we sit at the table, we sit for entertainment, we sit in our farm tractors, we sit in our long-haul trucks. Then, maybe we’ll jump up and get some exercise once in a while. The experts have long agreed that our sedentary lifestyle is killing us softly. But when “desk” equals “paycheck,” what are we to do? Answer: Acquire a sit-stand desk. Just take a look at what happens when we stand up at our desks more often while still executing our work. We spend more calories in a day when we elevate our altitude than when we sit at sea level with our old-school desks. Even if you don’t notice, balancing on our feet requires the subtle use of many more muscles, no less than 20 to be exact. But don’t just stand there, move your body, too. Sway your hips, do shallow knee bends. When not typing, swing your arms a bit. Anything to get up and moving is going to burn calories, even if those movements are subtle. Some studies suggest that standing more often helps your metabolic processes, which keep your blood sugar levels in the proper balance. This alone can help your cardiovascular health. With a sit-stand desk, you can lower the desk to chair height at will. Standing all day can cause its own set of problems. Just ask any supermarket cashier. If you remain on your feet all day, you risk deep vein thrombosis, swelling of feet and ankles, sciatica (ouch!) and lower back compression. The trick is to stand until your legs and back feel fatigued, then sit until your rear tells you to stand back up. Our bodies have an uncanny knack for alerting us when it’s been in one position long enough. If you’re the boss and would like to wring more productivity out of your staff, you should consider requisitioning sit-stand desks for them. When they arrive, you may need professionals to move them in and set them up. This is right up the alley of Expert Relocation Systems. We specialize in moving offices and installation of office furnishings including desks and cubicles, to name just two. For any type of heavy lifting, simply contact us today for a free quote. We have the muscle, the brains and the experience to move your office or warehouse and wrangle furniture remodels, too. A company’s meeting room bespeaks the corporate culture like no other space in the business. Much like a formal dining room in a house, the conference room hosts banquets of information sharing and collaboration. It can be as formal or informal, traditional or edgy as the company leaders desire. Because clients may never see any other part of the facility, companies would do well to plan their meeting rooms wisely. How they are set up reflects on the company image for better or for worse. Does your conference room broadcast the best image of your business to your clients and employees? Keep reading to find out. By naming your meeting room(s), you impart a sense of corporate personality. For instance, if your business makes or sells outdoor gear, you might like to refer to your meeting spaces with names like "Aspen Grove," or "Rushing River." Monikers tell people what’s important to your company. Leaving the rooms numbered and not named suggests a somewhat cold or itinerate nature of the business, as though it won’t personalize its rooms in case the occupancy of the building may change. It’s like not painting the walls and hanging pictures, so you can easily get your rental deposit back at the end of the lease. Decor: Traditional, Modern, Cafe or Edgy? How you furnish the room will resolutely divulge your company’s image. Traditional: A room with a long, rectangular table and plush chairs shouts, "We’re here to stay, and the boss is The Man (even if he’s a she). We have the deep pockets of stability, and we color within the lines." Modern: Lighter, more sleek furnishings speak of a nimble company going forward. It says, "We won’t rest on our laurels. The future is ours to seize." Cafe: A room with no central table but many comfortable seats and coffee tables with a kitchenette for food and beverage service declares, "We work together like a family. Brainstorm and stop fussing with your tie. It’s stained but we don’t care. In fact, why are you even wearing one?" Edgy: A room with futuristic, oddly-shaped tables and chairs that offer little comfort but stylistic innovation articulates, "We’re avant-garde. We invent the future. The past is passé. But don’t settle in, you might be over-challenged in this company." Rectangle: The classic long table with one seat at the head may be the only way you can go within the allotted square footage of your room, no matter your preferences. Even so, the shape promotes hierarchy more than collaboration. U-Shape: Tables formed in a U design make it easier for everyone to view a presentation. Plus it brings all the participants closer together for discussions and collaboration. For those one-on-one client meetings, the table allows you to sit across from each other, negating the subtle psychology of alpha/beta seating positions. Round: A round table is great for social equality, but can be less favorable for communications as people across the table may be too far away. Setting up your meeting spaces requires a lot of thought if you want to project the right image for your business. Of course, if you need multiple conference rooms, you can furnish each one according to a different function and aspect of the company’s overall personality. If it’s time to update your rooms, Expert Relocation Systems can help you move out your old furniture, then bring in the new pieces. We can even set up your whole room for you in the process. Contact us today for a free consultation and a free quote. Dark rooms should be used for sleeping, not working. Recent studies at Northwestern University determined working in a office with no windows can be harmful to the human body and mind, proving we all need light, especially health-boosting natural light, to thrive. This study used 49 office workers, all working a day shift, to conduct the experiment. Twenty-seven of these office workers had offices with no windows, while the remaining workers occupied desk locations with plenty of natural sunshine. After each work day had ended, questionnaires and other related tests were used to gather relevant information from all participants. The results of this ground-breaking study showed how the amount of natural light in the workplace can affect an office worker’s life to an amazing degree. This lack of light can cause people to sleep fewer hours and to experience more sleep disturbances than those that receive adequate light exposure. Also, the participants in the study reported a much lower level to their quality of life, complaining of lowered vitality and other daytime dysfunction, such as apathy. One of the reasons the lack of natural light can affect people so much is because our bodies use this light to set our internal clocks that control such things as the secretion of hormones, sleep cycles, physical performance levels and healthy mental states. When these internal clocks become disrupted for long periods, it can cause such diverse problems as depression, bipolar disorder, obesity, diabetes and thyroid disorders. Sleep disorders in today’s society have become epidemic as more and more people spend a good portion of their waking hours in a windowless work environment. The level of productivity at the workplace can be sharply affected by a lack of natural light. Working in a room lit by artificial light can have a detrimental effect not only on the eyes but on the human brain as well. Chronic cases of eyestrain, diminished eyesight and migraine headaches can usually be traced directly to a workplace’s harsh artificial lighting that is too dim or too bright. Extensive research has shown this type of poor office lighting contributes heavily to apathetic employees making mistakes and lowering overall office productivity. Over time, this can cost a business a great deal of money. If your company operates from an office building with little or no available natural light for your workers, you may consider moving your business to a better location for the sake of increased productivity and improved employee well-being. Recouping the initial cost of a move can be realized over time by healthier employees that make less costly mistakes. Expert Relocation Systems will make your business move as seamless and smooth as possible. Call us today at 512-291-MOVE and speak with a knowledgeable consultant today! Moving your office can be a major undertaking. While you’re busy alerting your clients of the change and buying new stationary, it can be hard to remember to set aside a time to actually compute a moving schedule and budget. Moving an office can be a hard expense to calculate, especially since it’s difficult to estimate size. Even if you’ve moved in the past, your next move can be completely different. Despite this, there are ways to estimate the costs of your next business move. Keep these things in mind as you make your budget. If you’ve put off making repairs to your office for a while, it’s important to remember that you may be responsible for getting everything in order before canceling your lease. Picking up every piece of furniture, computer and file can be costly. There are also expenses involved with downtime while employees set up their new workstations and get their computer equipment working again. Get several quotes from movers in the area to calculate this expense. The cost of your new office is more than just the rent. There are also deposits, taxes and possibly even legal fees. It might also be a good idea to compute your new utility costs, including any deposits or initial set-up fees that you may be charged. Remember that these costs can vary greatly based on location — some cities are simply more expensive to live and work in than others. Practically all of your brochures, business cards and other marketing materials will need to be replaced with ones that have your new address. If you’re getting everything reprinted, this might be a good time to review all of your materials and update it with new information. You may also need to print additional materials to notify clients that your building location has changed. This is particularly important if customers frequently visit your office in person. Depending on your business, your employees may need to be paid overtime to help with the move. In other cases, it may be necessary to set aside a time for your salaried employees to set up their offices. Larger offices may want to hire additional help during their move to pick up some of the work that regular employees won’t have time for. Other businesses may want temporary help if they’re moving a warehouse or large amounts of inventory. If you’re thinking about relocating your office, make sure you get advice from a company with years of experience in business relocation. Talk to our experts at Expert Relocation Systems today and get your office move started! Whether you manage 5 or 500 employees, you’ve likely heard about employee wellness being tossed around as a buzzword. While it’s definitely a trend, a workplace wellness program is also an important way to develop a stronger company culture while helping you earn savings on health care costs. Wellness programs encourage employees to take care of their health, and developing such a program could lend your business these five benefits. First, your employees will be healthier and spend less time out of work for simple and avoidable illnesses. For example, encouraging handwashing through the wellness program can cut down on missed work days significantly. Staying healthy also increases worker productivity since some employees will run out of sick days and come in ill, which could result in serious mistakes that take extra effort to fix. No matter how good of a health insurance policy you offer for your employees, they’ll still spend money out of pocket when they’re sick. From over the counter medications to transportation costs for getting back and forth to the doctor, it all adds up. 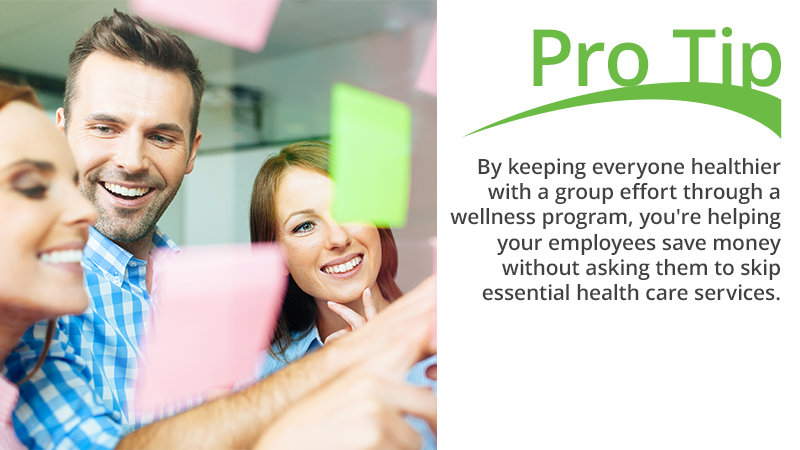 By keeping everyone healthier with a group effort through a wellness program, you’re helping your employees save money without asking them to skip essential health care services. If the program addresses obesity, sedentary lifestyles, and smoking, you may be able to qualify for group discounts from your insurance provider as well. On top of cutting costs for your employees, you’ll enjoy spending less on insurance as the employer as well. Insurance companies base their rates on the amount of claims made by your pool in the past few years. Sick employees visit the doctor more and make more claims on their insurance, leading to higher rates for the business to cover as the years go by. Healthy employees save their companies a lot of money in addition to cutting their own personal medical costs. Trying to attract the most qualified and experienced new hires to expand your business or replace lost talent? 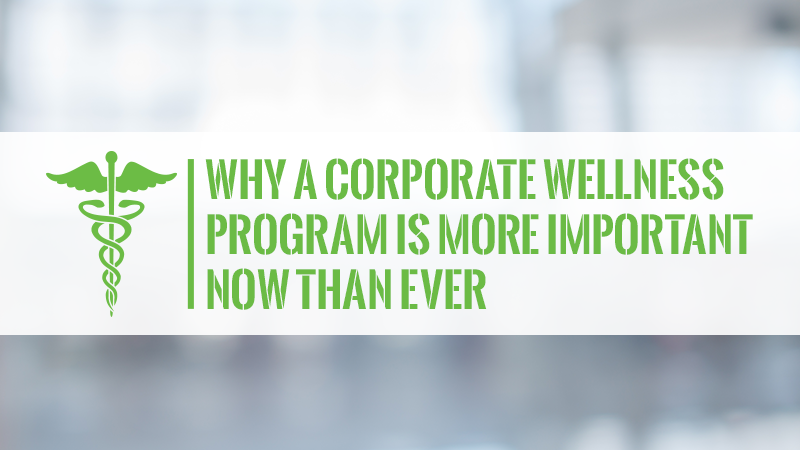 Along with comprehensive health insurance coverage, wellness programs go a long way in making your company attractive in a competitive job market. Not only does such a program signal you care about the people working for you, it also increases group cohesion. Offering a gym or other wellness perks at work can save employees a lot of extra travel time when they’re on a tight schedule too. Finally, you’ll notice how much more people get along after instituting a wellness program. Spending time together working out, quitting cigarettes, or just discussing health topics leads to better relations between employees. The increased cohesion boosts productivity and can prevent basic disagreements from turning into long-term problems. Considering a corporate relocation to better develop a wellness program? Talk to Expert Relocation Systems about your needs today! How Should I Set Up My Cubicle Space? After the proverbial dust settles on a corporate move, it’s time to start setting up the workspaces within your new office. While it’s easy to just arrange everything as close to how it was at your last office, this is a waste of a good opportunity for designing a better system. Office relocation gives you a chance to start with a blank canvas. Use these tips to create cubicle spaces that drive company culture instead of stifling it. First, consider how much each part of your team needs to work with others and plan your layout around their collaborations. For example, the marketing team will likely spend much of their team discussing current campaigns and brainstorming new ideas. Offering them an open layout that balances private spaces with a shared central hub can facilitate more sharing and easier communication. On the flip side, you should try more isolated work areas for employees that would only be distracted by coworkers trying to strike up a conversation. How much does your internal culture emphasize interaction and camaraderie? If your employees thrive on spending time together during breaks or meetings, you need to encourage their cohesion by designing the cubicle spaces around their desires. Open office layouts are great for teams that feel like they can’t get their best work done without the flexibility to move around as needed. Of course, the same layout could be devastating to the productivity if your company culture emphasizes more separation between individuals or departments. Positioning the workspaces to give a view of the windows, or hanging large screens to display nature scenes. Offering more opportunities for decorating and personalizing each workspace, like adjustable privacy panels and colorful fabric covers. Allowing employees to rearrange shared meeting and workspaces as necessary to fit their needs. Don’t forget that some parts of your company will benefit from having their own private spaces. Keeping your programmers or product designers together in a semi-private department allows them to build a subculture and get more done by focusing solely on their department’s responsibilities. Save the shared areas for break time if you need some of your departments to buckle down and power through challenges without distractions. Before you start packing that moving truck, contact us here at Expert Relocation Systems to learn more about how to set up a productive office. We’ll do whatever we can to keep you on track during your next corporate or office move.